Most of the “story lines” going into the Eleider Alvarez-Sergey Kovalev rematch revolved around the seeming fragile state of former unified light heavyweight champ from Russia. Fans and media put on their psychologist hats and surmised that Kovalev’s two losses to Andre Ward exposed him as a “bully,” “broke his spirit,” which ultimately set up the 35-year-old veteran to be KTFO by Alvarez in Round 7 of their competitive WBO title bout last August. Kovalev’s pending lawsuit for allegedly assaulting a woman in Big Bear, California last June didn’t inspire confidence among his dwindling fan base going into the February 2 rematch with Alvarez, and many predicted that he would fold from the first hard punch he took and that would likely be the end of his career, but the KO Artist Formerly Known as Krusher reminded everyone that he can box as well as he can punch. 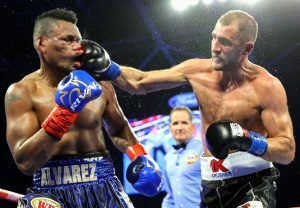 A focused and poised Kovalev (33-3-1, 28 knockouts) jabbed, moved and combo-punched his way to a clear-cut unanimous decision, handing the stifled Alvarez (24-1, 12 KOs) his first loss to regain the WBO belt. The Ring’s Ratings Panel was impressed with Kovalev, who seems rejuvenated under the guidance of new trainer Buddy McGirt, advanced the former pound-for-pound rated boxer-puncher to the No. 2 spot in the 175-pound rankings. Wainwright suggested dropping Alvarez, who had ascended to the No. 1 spot with his KO of Kovalev, to No. 5, and the rest of the Panel agreed. No shame in being the fifth best light heavyweight in the world. With Oleksandr Gvozdyk, Dmitry Bivol and Marcus Browne joining Kovalev and Alvarez in the top five, the 175-pound division is among the deepest in boxing. On the deep undercard of Alvarez-Kovalev 2, two lightweights took bold steps forward in their respective careers. 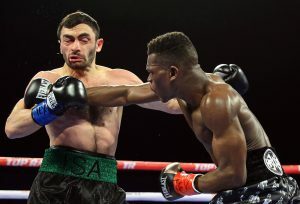 Contender Richard Commey stopped Isa Chaniev in R2 to grab the IBF title that barely eluded him 2½ years ago when he dropped a razor-thin split decision to Robert Easter Jr., a victory that moves the Ghanaian to the forefront of the Vasiliy Lomachenko sweepstakes; and The Ring’s 2018 Prospect of the Year brutally broke down former title challenger Diego Magdaleno to an impressive seventh-round stoppage. “Teofimo confirmed his potential with win over a Magdaleno, who I thought would give him some trouble early, but no such luck as Teofimo gave a star performance,” said Mulcahey. The Panel agreed that Commey (28-2, 25 KOs) deserved to advance one spot to No. 2, moving ahead of nemesis Easter, and to bring Lopez (12-0, 10 KOs) into the rankings at No. 10. Heavyweight – Adam Kownacki moved up one spot to No. 8 on the strength of his second-round stoppage of Gerald Washington. 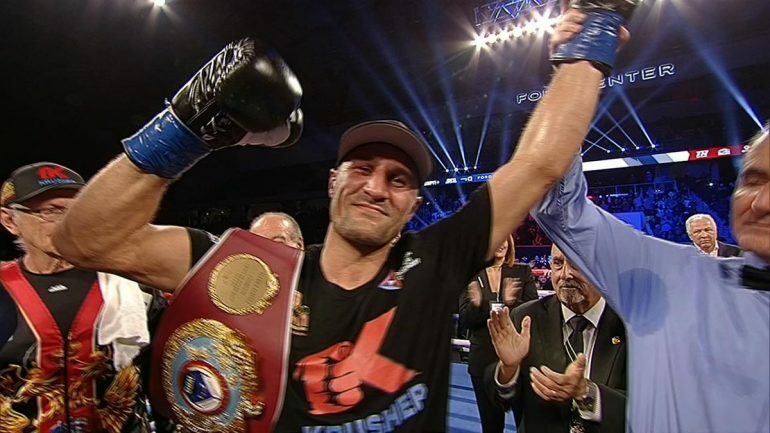 Light heavyweight – Kovalev advances to No. 2. Alvarez drops to No. 5. Super middleweight – George Groves announced his retirement, thus was removed, which made room for two-time title challenger Jessie Hart to return at No. 10. Junior middleweight – WBO beltholder Jaime Munguia remained at No. 3 after a hard-fought near shutout of gutsy Takeshi Inoue. Welterweight – WBA titleholder Keith Thurman remained at No. 3 after holding off the stern challenge of Josesito Lopez via majority decision. Wainwright suggest dropping Thurman a spot for struggling with a fringe contender, but he was overruled by other members of the Panel. “I’m probably in the minority, but I thought Keith Thurman looked pretty good considering the layoff and good opponent in return,” said Mulcahey. Panelist Diego Morilla also believed that Thurman won clearly and still has potential. 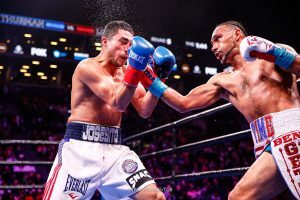 “I really liked Thurman’s performance, especially considering that he met the best Lopez I’ve seen in a long time, and after a long layoff,” said Morilla. Lightweight – Commey advanced to No. 2. Lopez enters at No. 10. Featherweight – WBO beltholder Oscar Valdez remains at No. 4 after stopping Carmine Tommasone in the seventh round. Jesus Rojas drops out of the ratings after being outpointed by Xu Can, who enters at No. 10. Junior bantamweight – Former title challenger Aston Palicte remains at No. 8 after blasting previously unbeaten Jose Martinez in two rounds. Flyweight – Japan’s unbeaten (18-0) Junto Nakatani enters the rankings at No. 10 following a ninth-round national title winning stoppage of Naoki Mochizuki.